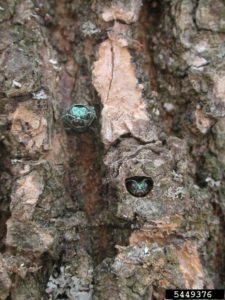 As reported last month, a keen-eyed young naturalist in Fort Worth submitted an observation of a green beetle on iNaturalist that was later identified as a possible emerald ash borer (Agrilus planipennis, EAB). State and federal biologists quickly mobilized to search the area. Allen Smith, Forest Health Coordinator for East Texas and Entomologist for Texas A&M Forest Service, presented an update at the TIPPC Conference. He noted that eventually, 6 suspected EAB larvae were found and sent to an expert for identification. The verdict: NOT EAB. However, the situation is complicated and still unresolved: it is possible that the larvae represent a new species, a hybrid, or a developmental anomaly as a result of the larvae developing on Arizona ash (Fraxinus velutina). More collections will be made soon to help to clarify the situation. Stay tuned!